After searching the supermarket every week for fresh Brussels spouts with no luck, I finally found them in a small, local grocery store. (“Shopping locally” turns out to be a good practice for more than one reason!) I’ve always said that I’m one of the few people who doesn’t really mind frozen Brussels sprouts, but after cooking these fresh ones, I may have to change my mind. These had so much flavor! I was worried that without oil the sprouts might burn, but as it turns out, they were fine with just a couple of sprays of olive oil. If you don’t have one, you can buy an oil sprayer fairly inexpensively–or, I’ve been told, you can fill a regular household sprayer with oil, but I’ve never tried that. I used balsamic vinegar during the cooking also, and that little bit of moisture also helps prevent burning. 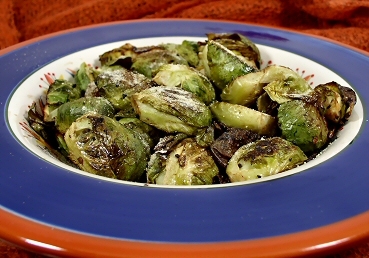 The most important trick, however, is to halve the sprouts so that the cooking time is shortened. Begin by preparing the sprouts: cut about 1/8-1/4-inch off the stem end, and remove any discolored or dried leaves. Cut the sprout in half, from top to bottom (through the stem end). Spray a glass baking dish lightly with olive oil. Add the sprouts and toss them with the garlic and a couple of teaspoons of balsamic vinegar. Give them one quick spritz of olive oil, and put them in the oven. Roast at 375 F for 10 minutes, stir, and roast for 10 more minutes. Remove from the oven, pour them into a serving bowl, and toss them with another teaspoon of balsamic vinegar. Serve sprinkled with soy Parmesan, if you like. We had these last night with corn on the cob, barbequed beans, and a salad, and they were a real treat. Thanks to Karina over at Gluten-Free Goddess for reminding me that roasted vegetables with balsamic vinegar is truly comfort food. Love roasted veggies, and am trying to cut back the amount of oil/fats I use in every day life! Thanks for this recipe; I knew to check here first! Now, am trying to practicing lentils without oil :), especially the "frying" spices part that is essential in indian cooking. Here we go! My husband is following a plant based diet – but without any oils/nuts. What can I substitute for the oil? The oil helps keep them from burning and drying out. You could try covering them as you roast them without oil. I followed the directions exactly and they were not cooked well enough, so I cooked them for 5 minutes more at 400 and still not cooked enough. I mean they seemed about half done… still crunchy.